Despite a couple of leaks that made it clear that Ubisoft’s teaser from yesterday was a prehistoric Far Cry game, Far Cry Primal, its announcement has still come as a welcome surprise. 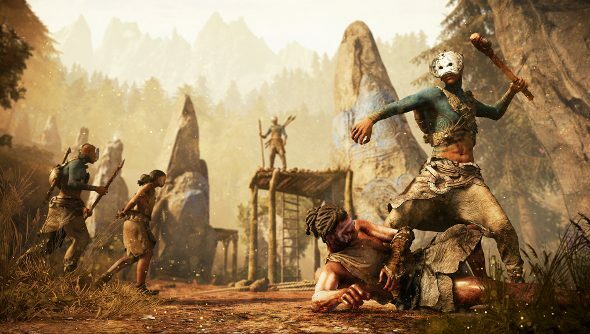 After Far Cry 4 just continued what Ubisoft Montreal has done with its predecessor, it’s a relief to see them heading off 12,000 years into the past. Far Cry Primal will be a “full-fledged” single-player game set during the Stone Age, complete with woolly mammoths and big-toothed predators. According to Ubisoft, they wanted to bring the sandbox to an era when humanity wasn’t at the top of the food chain, but was still trying to climb it. It looks like Primal will be taking the series in a more survival-focused direction. Playing as the hunter Takkar, you’ll need to hunt for food, craft weapons from bone and wood, learn how to make fire and get into dangerous scraps with hungry predators. I suddenly find myself interested in Far Cry again. In fairness, I’ve always been a fan of the series, but by 4 I started to feel that it had run out of ideas; it wasn’t the departure that 3 was compared to 2, or 2 was compared to the original. Each game had a great hook, something that set it apart, but 4 seemed to be a more conservative sequel with a bloated open world. Leaving the modern world for the Stone Age, though, that’s an unexpected twist. And while survival games are a dime a dozen, I’m immediately intrigued by the prospect of a large studio like Ubisoft Montreal trying their hand at it, especially when it seems like such a good fit for Far Cry’s theme of one man fighting hordes of foes in the wilderness. Far Cry Primal is due to launch in March on PC, while the console lot get it in February.